Janny van Wering (1909–2005) was the first professional Dutch harpsichordist of the twentieth century. 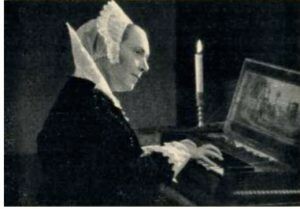 Inspired by leading pioneers of early music such as Wanda Landowska, Pauline Aubert and Arnold Dolmetsch, van Wering’s performances, as well as her teaching, played a large role in reviving the popularity of the harpsichord in the Netherlands. Van Wering was born in Oude Pekela, where her father was a doctor and also mayor of the village. Following his untimely death in 1918, her mother took the family to Groningen, where Janny continued her piano lessons, which she had started at the age of eight. As she showed exceptional talent for the piano, she was offered a place at the conservatories of both The Hague and Amsterdam when she was only seventeen. She decided upon Amsterdam (so that she could study with Martha Autengruber and, later, with Paul Frenkel), and together with her mother and brother she moved there before she finished high school. Please subscribe to this blog – in the top right corner – and receive notifications of new posts by e-mail. If you would like to help us to get more readers, then please “like” this page, at the top, and “like” Semibrevity, on the right. And do share this post with your friends! Following her final piano exam in 1932, the Director of the Conservatory, Sem Dresden, advised her to study the harpsichord (as he knew she was keen on Bach). He told her: “In Holland, there will be room for only one harpsichordist.” Two years of harpsichord study followed with Richard Boer in Amsterdam and with Pauline Aubert, largely in Paris. Aubert, the famous French harpsichordist, who had been a student of Arnold Dolmetsch, had frequently given lectures on historic performance practice for the piano teachers at the Amsterdam Conservatory, and it was here that they had first met and started lessons. 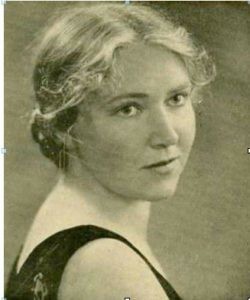 After passing her harpsichord exams in 1934, van Wering was awarded the prestigious Julius Röntgen prize (which allowed her to study further in Paris), and so began her career as the first ever qualified Dutch harpsichordist. She made her debut in the Recital Hall of the Concertgebouw on 9 February 1935, playing works by Sweelinck, Frescobaldi, Bach, Couperin and Scarlatti. The concert was well received by both the audience and the critics, one of whom described her as “ a trail-blazer … with a high level of musicality, intelligence and taste”. Van Wering taught herself how to play basso continuo from a figured bass (primarily using F.T. Arnold’s 1931 book on the subject), and this led to her becoming the most sought-after continuo player in Holland for large choral works. Much later, she was to play for performances of the St Matthew Passion by the Concertgebouw Orchestra, given under Eduard van Beinum and Eugen Jochum. During the war, she played at the Rijksmuseum, often repeating the same programme every day for week, organised house concerts for up to 100 people, taught piano privately and, for three years, took a class of fifty unruly children at a music school. She also began work as harpsichord teacher at the Amsterdam Conservatory in 1944. After the war, Janny van Wering was employed by the Dutch Radio Union, to give two concerts a week, which she did for the next 24 years! Around the same time, the Radio Chamber Orchestra was formed; Janny van Wering was a founding member who remained until 1969. As there wasn’t much harpsichording to do, because of their rather limited baroque repertoire, she would often accompany singers on the piano and would even sometimes end up playing the celeste. She played in many ad-hoc ensembles throughout her career, and performed regularly in the Concertgebouw with the likes of Alfred Deller, the violinists Theo Olof, Szymon Goldberg and Jaap Schröder (who was concert-master of the Radio Chamber Orchestra from 1950), the flautist Frans Vester, the oboist Han de Vries, the cellist Carel van Leeuwen Boomkamp and the alto Annie Hermes. Van Wering also appeared in many different ensembles on disc, and performed with all the important pre-Leonhardt generation of musicians who laid the foundations for the early music “mob” (Janny’s word) that was to follow. Curiously, she made very few solo records. From 1947, she taught harpsichord and ensemble playing, with Carel van Leeuwen Boomkamp, at the Royal Conservatory in The Hague. She was also interested in musicology and produced two editions, as well as penning many unpublished writings on subjects ranging from ornamentation to basso continuo. Apart from the baroque repertoire, she regularly performed contemporary music; she had a special affinity for the works of Frank Martin and performed his harpsichord concerto and Petite symphonie concertante several times. Many composers wrote both solo pieces and chamber music for her. Janny van Wering once commented that the 1950s were the climax of her career, as she never gave as many solo performances in later years as she had in that decade. Although she had dispelled the doubts of her student, Jaap Spigt, about playing with recorder virtuoso Kees Otten, Janny van Wering admitted that she had not taken the recorder very seriously herself before playing with Brüggen, in 1954, during his debut radio broadcast. For her, the recorder summoned up the spirit of the Socialist Workers’ Youth Movement (the AJC), which promoted physical exercise, folk dancing and amateur music-making – mostly on recorders – as a means of developing and educating young people. 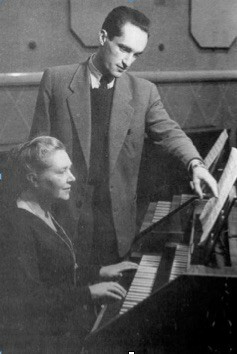 However, she described the recording session in 1954 as “a revelation”, so much so that, after the broadcast, she offered to play with Brüggen again, and they subsequently performed a great deal together. In the late 1950s they gave a series of 15 or 20 school concerts with the violinist Jaap Schröder (with whom they made a record of Telemann Trio Sonatas in 1958). Although Brüggen often played with Gustav Leonhardt, his collaboration with van Wering continued until at least 1963, when they gave a concert together in the Amsterdam Concertgebouw in May and a radio broadcast for the BBC’s Third Programme in September. Listen to G.P. Telemann – Sonata in C played by Frans Brüggen and Janny van Wering. When the Netherlands Chamber Orchestra was founded in 1954, Janny van Wering became their harpsichordist. With this orchestra, she made concert tours to Japan, America and Australia. 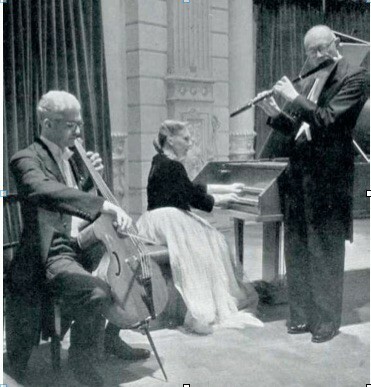 Also her work with ensembles took her abroad; Sonata da Camera, with Willem Noske, Piet Nijland and Victor Bouguenon, which she joined in 1967, not only toured all over Europe but went as far as South America. Including solo programmes and studio concerts with the Dutch Harpsichord Trio (Janny, Johan Feltkamp, flute, and Piet Lentz, gamba), see photo below, she made around 20 broadcasts for the BBC, starting in 1946. “He turned out to be a very nice man. In the beginning, we played together, and with one or two other harpsichordists [in concertos, in concerts and on records]. I knew very quickly that he was my superior, in all respects really: in terms of common sense and musicality. Van Wering accepted another teaching post in 1957, this time at the Rotterdam Conservatory, where she taught harpsichord and ensemble playing for the next 17 years. Perhaps because she had been brought up on an all-wooden Gaveau at the Amsterdam Conservatory, van Wering chose, in 1933, to buy a six-pedal Neupert harpsichord (at a cost of 2000 guilders) which didn’t have an iron frame. Later, she also owned a gargantuan Pleyel. She normally took the Neupert on tour until, in 1963, she bought a two-manual historically inspired Rainer Schütze instrument (884, lute), without pedals. Although Janny van Wering officially retired when she was 65, in 1974, she continued with the Netherlands Chamber Orchestra for another year; it was with them that she made her final recording, of Haydn’s Concerto for harpsichord in D major. In her regular work, she was succeeded by five harpsichordists: Bob van Asperen at the Royal Conservatory in The Hague; the American, Glen Wilson, with the Netherlands Chamber Orchestra; elsewhere, three of her students took over: the Belgian, Maria Kogan, at the Rotterdam Conservatory; Jaap Spigt joined the ensemble Sonata da Camera; and Marijke Smit Sibinga assumed van Wering’s radio commitments. In the year of her retirement, she was made Knight in the Order of Orange Nassau, and in 1975 was awarded the Silver Medal of Honor of the City of Amsterdam. Janny van Wering died in Amsterdam on 1 March 2005, aged 95. Thanks are due to the Dutch pianist, harpsichordist and musicologist, Henriëtte Wirth, on whose PhD dissertation this post is primarily based. The whole dissertation (in Dutch), about Henriëtte’s great aunt, Janny van Wering, is available to download here. As ever, that excellent book, Oude muziek in Nederland, by Jolande van der Klis, has been a valuable source; the English translation of various quotes is my own. Thank you very much for yet another informative and interesting article.